M.Notkin. Gentlemen, make your mistakes! M.Notkin. Who’s Afraid Of The Queens Exchange? Topalov-Anand becomes the best game of the year! Game of the Month summary: Ivanchuk-Volkov wins in September! PEARL OF THE DAY №8: WHO WILL DARE TO HURT OUR KING? PEARL OF DAY №7: SAVIELLY, YOU ARE NOT RIGHT! PEARL OF THE DAY №11: WHERE WILL MY PRANKSTER GALLOP? PEARL OF THE DAY №5: PEARL BARLEY, SIR! The game A.Dreev – L.Dominguez becomes the March laureate! The game Ponomariov-Kramnik is the best one in January! The game A. Grischuk - A. Dreev becomes February's laureate! The site leadership trying not to make an example of Peter's principle out of my career, as they gave me a suitable job for the world championship. If the employee is considered to be competent enough to choose about twenty model games out of several hundreds, then he can act in the same way and choose one out of four. And like the participants of the San Luis tournament were asked to make it clear to the chess fans why they should not be indifferent to the competition, I had to explain the readers why they should admire and applaud to the best game of the day. Possible difficulties are obvious and explained by Viktor Lvovich Korchnoi in the annotations to the last game of the «My Best Games 1: Games with White» collection: «This book had to become just the translation of English and German 2001 year editions into Russian, but Russian publisher Mr. M.Amannazarov insisted on making it more up-to-date, that means to add about ten games played during last two or three years. I objected that there maybe not enough games deserving to get in the book, because I play them and not invent them, but the publisher was uncompromising». As applied to our case: and what if all the games of the round will be like half of the games in the Kramnik-Leko match, that means quick and conflict-free? What shall we do then? Trying to answer this question, we have to remind ourselves and others that our pearl providers are the best ones in the world, so they cannot let us down. The eight outstanding grandmasters gathered in Argentina will certainly produce more than enough desired material. And if in the middle of the tournament there will be a lean day (or a day off, it is inevitable), we will have a chance to analyze in detail some previous game and regard it suitable to our necklace. But let us also consider the pessimistic variant, especially as the first playing day practically makes us do that. There as no gold reserves, and none of the played games will enter the candidate list of the best game of the month, I am sure. But this should not disturb us. The commentators of all sports learned how to fill the gaps, and it would be absurd for us not to invent something. Let us go on to the topic and see the result of the first round from the malicious chess fan's point of view. The charms of night online with its excitement and feverish opinion exchange went away, and being sleepy he looks through the game texts with thick head and sees, that Svidler and Adams made seven and a half original moves and then agreed to a draw, and Silvio Danailov already made a note not to invite them to Sofia next year. Morozevich and Kasimdzhanov played long and dull, and only the victory of one of the opponents could give some historical value to this game, but they both made blunders before control, and the barometer finger stopped at «Great dry» mark, having twitched twice nervously. Topalov played an outrageous (speaking plainly) opening against Leko, but the latter, instead of deciding the game with the help of Tal-Kasparov-like attack, contrived to go on to ending , where his ferocious knights turned out to be good for nothing. Finally, Judit in contrast to her compatriot seemed to have decided to direct her heavy guns at the opponent's king's residence, but she treated them surprisingly blankly, so the opponent did not need to be Anand to repulse the half-illusory threats and make a destructive counterattack. It does not suit us: after FIDE establishment of doping control none of the annotators familiar to me takes prohibited medications to broaden his conscience and get psychodelic view of chess masterpieces. But there is no need in them. Friendly attitude is enough, and many seemingly dull games will reveal undercurrents (to avoid misunderstanding – I am serious). And though the games of the first day cannot make you cry (if you are not a Hungarian, of course), they cannot be called dull. Sergey Shipov's annotations will color them for sure, although his critical judgment will not fail to take all the mistakes in color and lines into account. But ordinary tension is not enough for us, we search for beauty and perfection here. And that is why we acknowledge Anand's victory as the first pearl. Yes, there are questions to Judit, but Viswanathan was blameless. Nevertheless, it is so with minor reservations. 1.e4 c6 2.d4 d5 3.¤c3 dxe4 4.¤xe4 ¤d7 5.Ґd3 ¤gf6 6.¤f3 ¤xe4 7.Ґxe4 ¤f6 8.Ґd3 Ґg4 9.Ґe3 e6 10.c3 Ґd6 11.h3 Ґh5 12.Јe2 Јa5 13.a4 0-0. We will discuss the nuances of the opening next time, when both opponents will really play the opening, but not just develop the pieces purposelessly as Polgar does. Now her mood changes abruptly, and she suggests an opponent to sharpen the play. It is quite understandable that she was annoyed by the pinned f3-knight, but the short castling in such situation looks more appropriate, and if one prepares for the long one, then it is better to avoid such moves as a2-a4. 14.Јc2 Ґxf3 15.gxf3 Јh5. Let me define the assessment more accurately. I am not going to suggest that an average player could defeat Judit in this game, but Anad's moves are quite understandable and comprehensible to any experienced Caro-Kann player. The knight should be placed on the d5 square, and for that you should defend the h7-pawn first of all. Moreover, it would be unwise to leave the kingside without defense in view of the open g-file. 16.0-0-0. 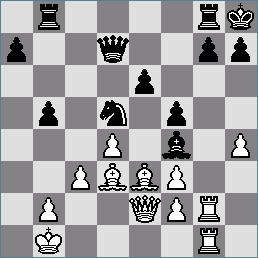 It seems doubtful that a careless play like 16.¦g1 ¤d5 17.¦g5 Јxh3 (17...Јh4!?) 18.0-0-0 can lead to the real chance to create an attack, but without any doubt White will lose the pawns. 16...¤d5 17.ўb1 b5! 18.¦dg1 f6. Black queen is almost inaccessible, and the ice is about to break up on the queenside. 19.axb5. 19.a5 is hardly stronger – with such a pawn structure the file will be opened sooner or later. 19...cxb5 20.Ґc1. Soon Judit will put the bishop back on e3 because of the tactical reasons. It seems to me that the queen maneuver she conducts during next moves could be better prepared by 20.Ґe2. 20...¦ab8 21.Јe2 ¦fe8 22.Јe4 ўh8. Fritz suggests 22...b4, giving advantage to Black after sample 23.c4 f5 24.Јe2 ¤f4 25.Ґxf4 Ґxf4 26.c5, but Anand calmly makes defensive and preventive moves, admiring the knight standing on the d5-square. 23.h4. I think it was the last moment when White could change anything. In case of 23.Јg4 (besides, this move looks the most logical after the preceding moves) 23...Јf7 24.¦g2 Black would have to pay some attention to the kingside, and after bad pawn move the rook on the g8-square is enough to defend all and everything. 23...f5! 24.Јe2 Јf7 25.¦g2 Ґf4. One could switch to the queenside immediately by 25...Јd7 26.¦hg1 b4! On 27.c4 or 27.¦xg7 the 27...Јa4 move gives a decisive attack. In case of 27.Ґb5 Јxb5 (here the pawn surrender g7 – 27...¦xb5 28.¦xg7 leads to the double-edged play) 28.Јxb5 ¦xb5 29.c4 ¦b7 30.cxd5 exd5 Black has a technically won ending with an extra pawn. One can easily understand Vishy: why should the player consider the variations with the opponent's rook near his king when he has a good position. And as Polgar did not have chance to sharpen the play later on, one does not have to blame Anand for some slowness. 28.Јd2. At first Fritz gets inspired by 28.h5 (with an idea to open the long black diagonal), but, by answering 28...b4, one can easily see that either in case of 29.c4 ¤c3+ 30.bxc3 bxc3+ 31.ўa1 ¦b4 32.Ґxf4 ¦a4+ 33.ўb1 Јb7+, or 29.h6 ¤xc3+! 30.bxc3 bxc3+ 31.ўa1 (31.ўc1 Јa4) 31...Ґxh6! 32.Ґxh6 (32.Ґc2 Јd6) 32...c2! White has no time to do anything, and her king gets under heavy fire and dies. 28...Ґd6 29.Ґc2 Јb7 (there was no need to put off 29...b4) 30.Ґg5 b4 31.c4 b3! Black king will move only when it brings an immediate victory. 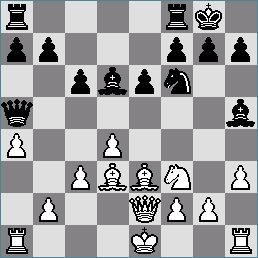 Now 31...¤c3+ 32.ўc1 Јxf3 with the hope of 33.bxc3 bxc3 34.Јe3 Ґa3# would be much weaker. White replied 33.Ґd3, and the game is lingering. 32.Ґd3. 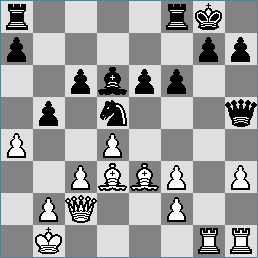 After 32.cxd5 bxc2+ 33.Јxc2 ¦gc8 34.Јe2 Јxd5 White's rooks positioning is ridiculous. 32...Ґb4 33.Јe2 Јa6 34.Ґh6. The chess queen is tardy with creation of the threats. 34...¤c3+! 35.bxc3 Ґxc3 36.ўc1 Јa3+?! A small indulgence in the opponent's time trouble. 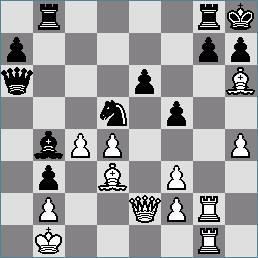 36...b2+ 37.ўb1 Јa1+ 38.ўc2 Јa2 39.ўd1 Јa4+ led to mate. But here there are many ways to the victory. 37.ўd1 Јa1+ 38.Ґc1 b2 39.Јe3 Ґxd4 40.Јd2 bxc1Ј+ 41.Јxc1 Јa2. White resigned. It is the first object in our collection, and there is a huge amount of the reserves for the perfection. Let us wait for the second round. P.S. According to the fresh news from Budapest, the prohibition of the long castling for all the citizens was introduced since September 29.